NEAT PURSE THAT CAN BE CARRIED AS CLUTCH OR SHOULDER BAG! 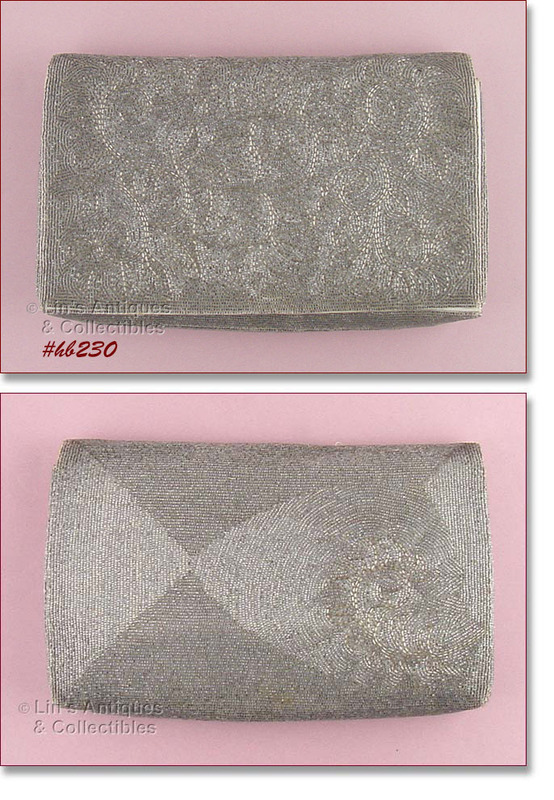 IT’S SILVER COLOR MESH (THERE ARE NO MISSING PIECES/IT’S LIGHT REFLECTION IN PHOTOS) AND HAS A SILVER COLOR CHAIN THAT CAN BE FOLDED INSIDE THE BAG. MEASURES 6 ¼” X 5 ½” X 2 ¾” (THOSE ARE CLOSED MEASUREMENTS). HAS INTERIOR LABEL “WHITING & DAVIS, SINCE 1876”. THERE IS A SMALL DISCOLORATION AT BOTTOM ON ONE SIDE THAT IS NOT DETRIMENTAL AND CAN BE SEEN IN PHOTO IF YOU LOOK CLOSELY. THIS IS A VERY NICE HANDBAG AND IS PRICED TO REFLECT BEING A LITTLE LESS THAN PERFECT. 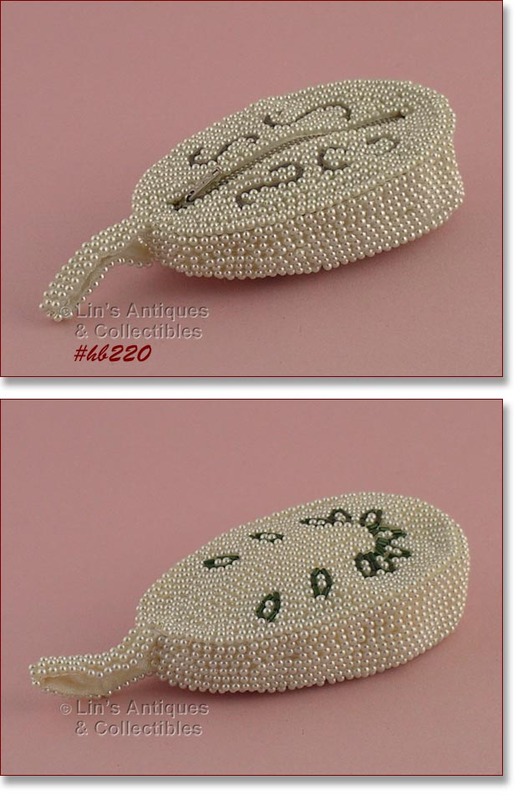 THIS CHANGE/COIN PURSE IS GORGEOUS – THE BEADING IS SIMPLY OUTSTANDING! IT MEASURES 3 ½” X 3 ½” AND APPEARS TO HAVE NEVER BEEN USED. THE INTERIOR IS CLEAN AND HAS “DELILL, HAND MADE IN KOREA” TAG. IT CLOSES SNUGLY/SECURELY AND WOULD BE SUPER TUCKED INSIDE THE JOSEFF BAG WE HAVE LISTED! SUPER CONDITION VINTAGE AIGNER HANDBAG! PURSE IS CLUTCH STYLE WITH SPRING/PRESSURE CLOSURE – NO SNAPS, NO ZIPPERS! MEASURES 13 ½” X 8 ¼” AND IS IN AIGNER’S SIGNATURE OX BLOOD COLOR. THIS IS NOT YOUR EVERYDAY FIND – IT’S A LADIES FANCY CIGARETTE LIGHTER FOR AN EVENING BAG! 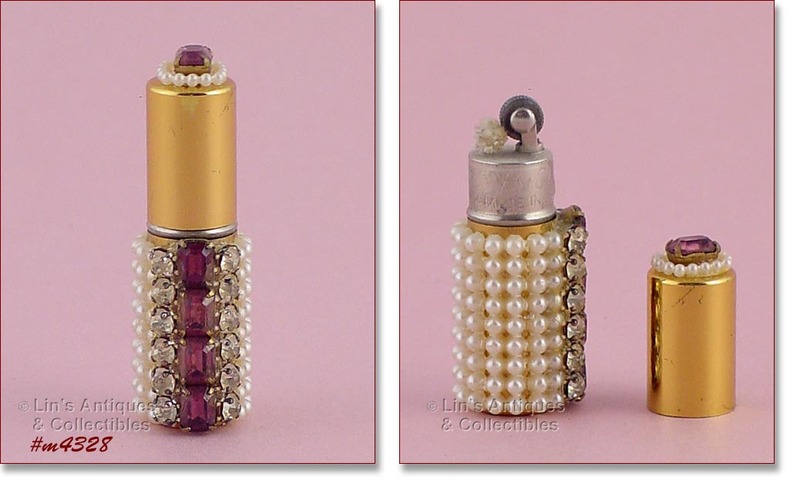 THE LIGHTER IS GOLD-TONE METAL, IS COVERED WITH FAUX PEARLS AND AMETHYSTS, AND MEASURES 2 3/8” TALL. THE LIGHTER IS MARKED “HY-GLO, MADE IN USA” AND HAS NEVER BEEN USED! THIS IS THE FIRST JOSEF BEADED BAG THAT I PURCHASED FOR MY COLLECTION! I LOVED IT SO MUCH THAT I BEGAN SEARCHING FOR MORE AND FOUND 2 MORE (THEY WILL ALSO BE LISTED). THIS JOSEF BAG IS IN SUPER CONDITION WITH THE ONLY EVIDENCE OF “USE” BEING SOME VERY MINOR DISCOLORATION ON INTERIOR BY THE SNAP CLOSURE. THE BEADING IS SUPER, THE DESIGN IS LOVELY, AND THE JOSEF TAG IS INTACT. HANDBAG MEASURES 10 ½” X 6 ½”. IT IS ENVELOPE STYLE (FOLD OVER FRONT FLAP) TO CARRY AS A CLUTCH. I HAVE OWNED THIS BAG OVER 20 YEARS AND AS WITH ALL MY VINTAGE PURSES, IT HAS NOT BEEN USED BY ME – JUST DISPLAYED OR KEPT IN A DRAWER. JOSEF HANDBAGS ARE QUALITY HANDBAGS AND ARE DIFFICULT TO FIND! ABSOLUTELY BEAUTIFUL BEADED HANDBAG! THIS IS A WALBORG PURSE AND HAS GORGEOUS BEADING. MEASURES 8” LONG, 5” TALL, AND 2 ¼” WIDE (CLOSED, BOTTOM MEASUREMENT). HANDBAG IS IN EXCELLENT CONDITION – IT APPEARS TO HAVE NEVER BEEN USED! 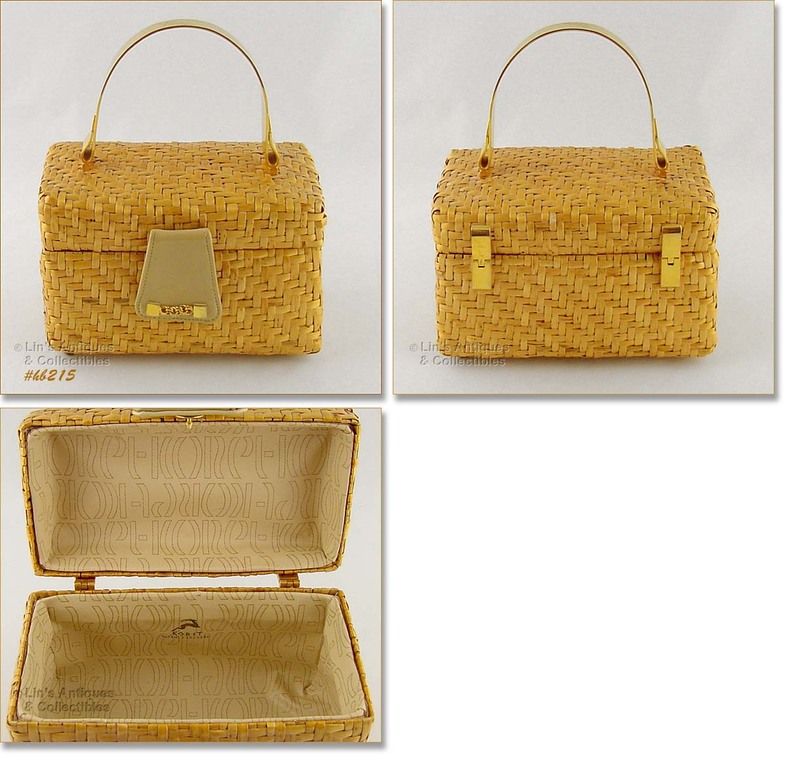 THIS LISTING HAS AN ENID COLLINS WOODEN BOX BAG! IT IS TITLED “MONEY TREE II”, MEASURES 11 1/16” LONG, 8 1/16” TALL, AND 2 ¾” WIDE (CLOSED). PURSE IS IN VERY GOOD VINTAGE CONDITION – INTERIOR HAS ONE BLACK SPOT (INK OR MARKER), EXTERIOR HAS VERY MINOR “USE” EVIDENCE. THERE ARE NO MISSING BEADS OR COINS. 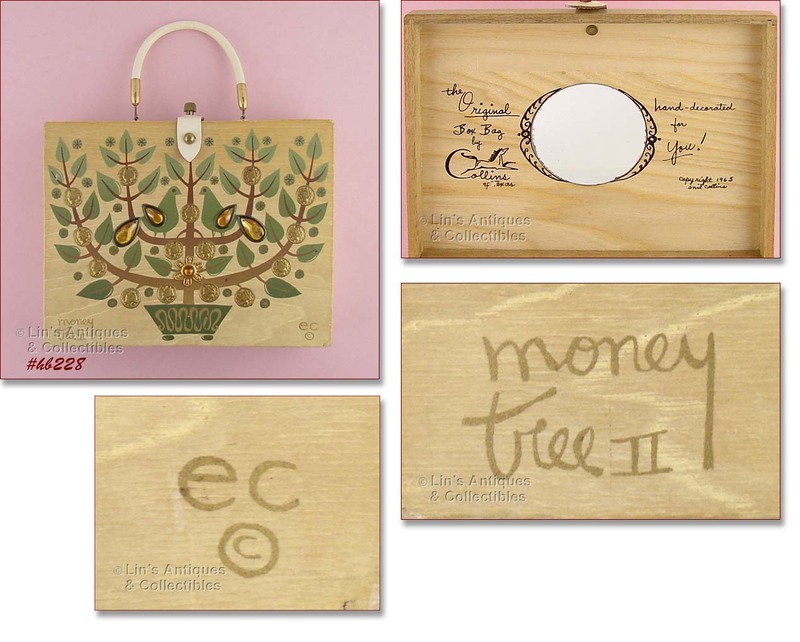 FRONT OF PURSE HAS “MONEY TREE II” IN ONE LOWER CORNER, THE OTHER LOWER CORNER HAS “EC” AND COPYRIGHT SYMBOL. INTERIOR HAS “THE ORIGINAL BOX BAG BY COLLINS OF TEXAS, HAND-DECORATED FOR YOU! COPYRIGHT 1965 ENID COLLINS”. SUPER NEAT HANDBAG! ANOTHER EVENING BAG FROM MY VINTAGE HANDBAG COLLECTION! 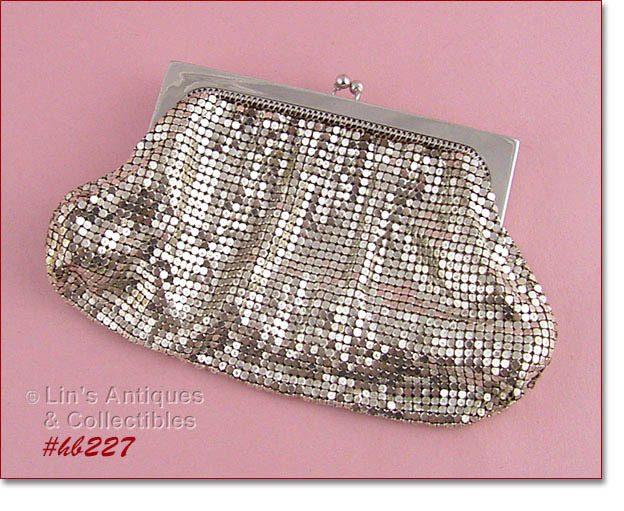 THIS ONE IS SILVER COLOR METAL MESH, MADE BY WHITING DAVIS, MEASURES 6 ½” LONG (AT LONGEST) X 4 ¼”. THE INTERIOR HAS A COUPLE SMALL DOTS – THAT’S IT. THE METAL CLOSURE IS MARKED/STAMPED “MADE IN U.S.A., WHITING & DAVIS, 2891”. HANDBAG IS CLUTCH STYLE. VERY PRETTY! GORGEOUS COIN PURSE WITH A BEADED FLORAL DESIGN ON FRONT! MEASURES 3 ¼” DIAMETER AND IS CLEAN INSIDE AND OUT! 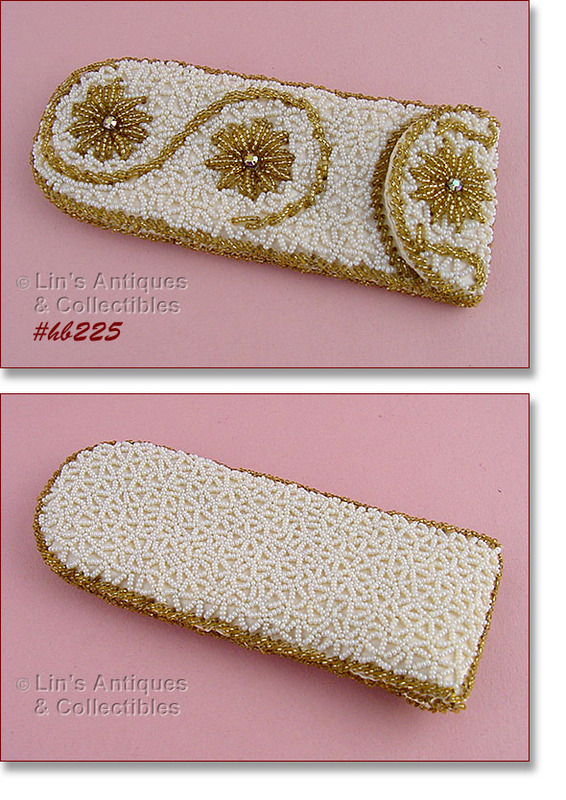 EXCELLENT CONDITION AND EXTREMELY WELL MADE EYEGLASSES CASE! MEASURES 6 ¼” LONG, 2 5/8” WIDE, AND HAS SNAP CLOSURE. THERE ARE 3 AURORA BOREALIS RHINESTONES ON FRONT AND THEY’RE PRONG SET – AS NOTED, EXTREMELY WELL MADE! ANOTHER BEAUTIFUL HANDBAG FROM MY COLLECTION! IT’S BEADED WITH A DESIGN ON FRONT AND BACK THAT REMINDS ME OF POINSETTIAS. IT IS CLEAN INSIDE AND OUT (THERE ARE A COUPLE OF SMALL NON-DETRIMENTAL DISCOLORATIONS (LIKE DOTS ON THE EXTERIOR BOTTOM). INTERIOR LABEL HAS “TMC BRAND, TUPELO, MISSI., MADE IN KOREA”. THE SNAP CLOSURE HAS TWO AURORA BOREALIS RHINESTONES. 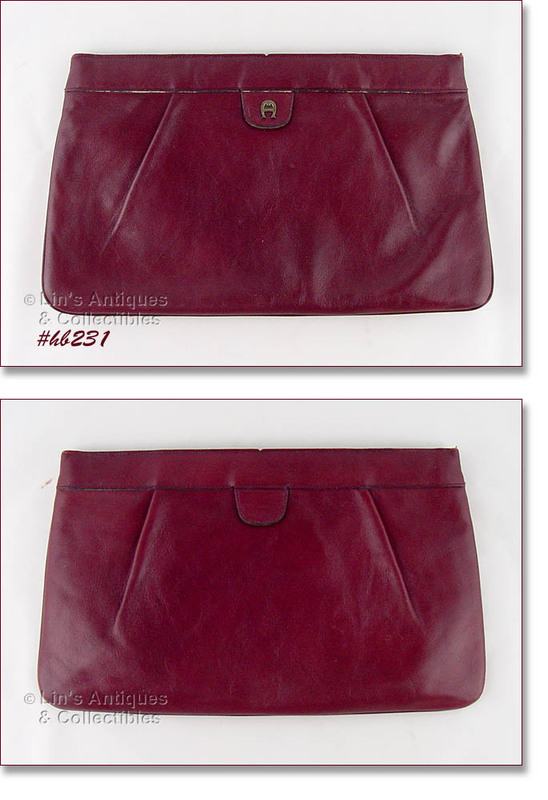 HANDBAG MEASURES 7 ½” LONG, 5 ½” TALL (NOT INCLUDING CARRY STRAP/HANDLE), AND 1 ¼” WIDE (BOTTOM MEASUREMENT). SIMPLY EXQUISITE! 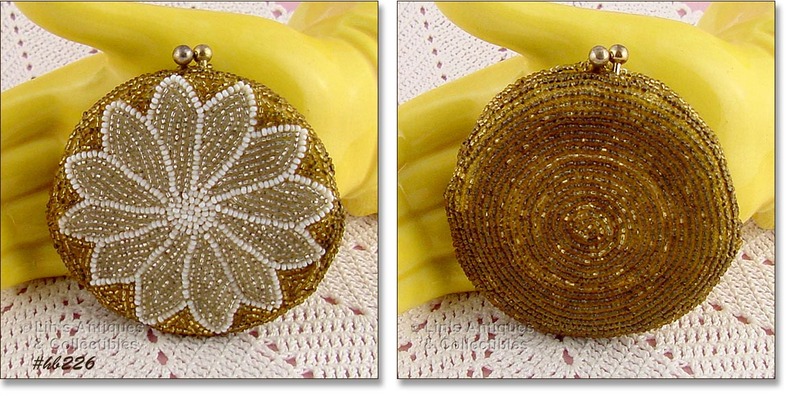 THIS LISTING HAS A BEAUTIFUL VINTAGE HANDMADE BEADED EVENING BAG. IT HAS INSIDE LABEL “HAND MADE IN BELGIUM” AND MEASURES 7 ¾” X 4 1/8”. I PURCHASED THIS HANDBAG MANY, MANY YEARS AGO AND I BELIEVE IT WAS (AND IS) IN THE ORIGINAL BOX. THE ORIGINAL OWNER WROTE ON THE BOX IN PENCIL “BROUGHT FROM OVERSEAS, HAND-MADE IN BELGIUM”. I NEVER USED OR DISPLAYED THIS BEAUTIFUL PURSE. I LEFT IT IN THE BOX AND STORED IT IN A DRESSER DRAWER SO THERE IS NO SUN FADING OR DISCOLORATION ON THE HANDBAG. IT IS GORGEOUS! 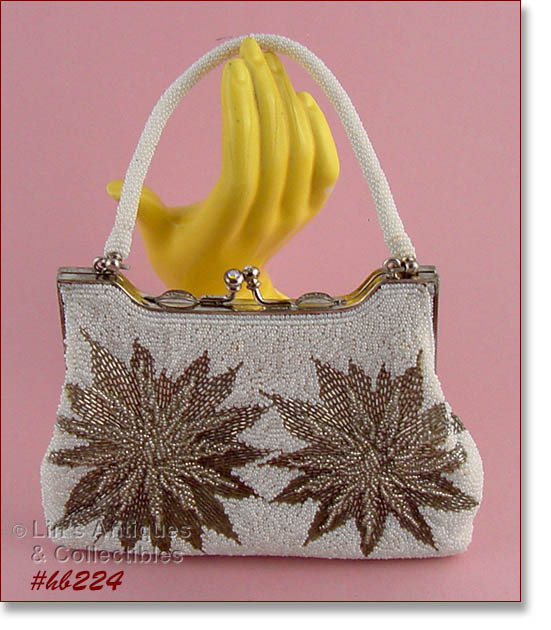 I HAVE PULLED ALL THE BEADED PURSES FROM MY VINTAGE PURSE COLLECTION AND AM LISTING THEM. I HAVE ENJOYED COLLECTING AND ADMIRING THEM (NEVER USED ANY OF THEM!) AND IT IS NOW TIME TO SHARE. THIS LISTING HAS A SMALL SHOE SHAPED COIN PURSE. IT MEASURES 4 ¾” LONG (AT LONGEST), 2” WIDE (AT WIDEST), AND 1 ¼” TALL. INSIDE HAS A LITTLE ROUND SHAPED “MADE IN JAPAN” BLUE STICKER. EXCELLENT CONDITION! THIS IS SO CUTE – IT’S AN EVENING “ESSENTIALS” LITTLE PURSE – IT WILL HOLD A LIPSTICK, MONEY, CREDIT CARDS, ETC! HAS A ZIPPERED FRONT (WORKS GREAT) AND INSIDE HAS “MADE IN JAPAN” LABEL. MEASURES 4” AT LONGEST (NOT INCLUDING THE LITTLE CARRY HANDLE), 2 3/8” WIDE (AT WIDEST) AND 1” IN HEIGHT (4” X 2 3/8” X 1”). NEAT ITEM THAT HAS BEEN IN MY COLLECTION OVER 20 YEARS! 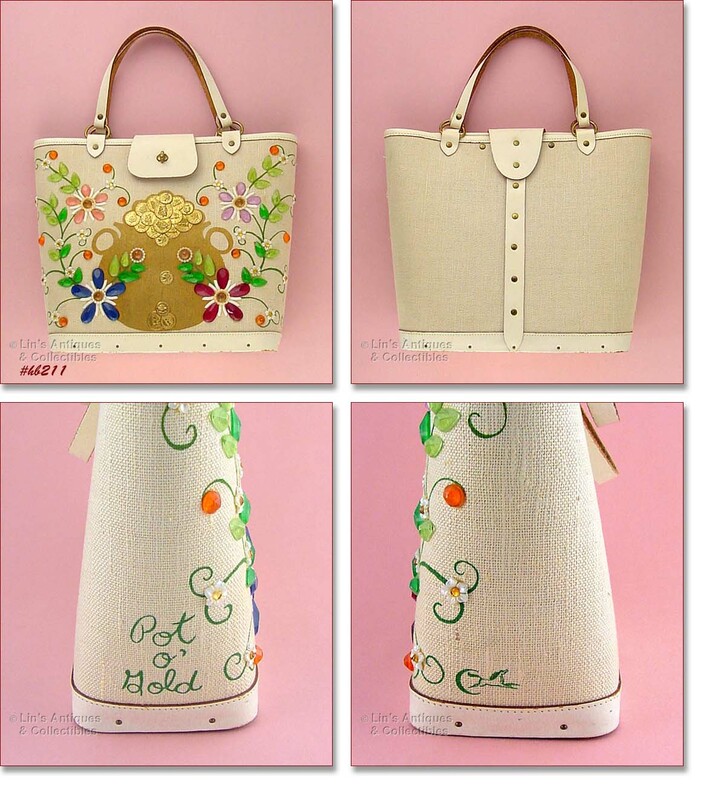 THESE HANDBAGS MADE BY LITTLEARTH COMPANY ARE BOTH COLLECTIBLE AND DIFFICULT TO FIND! MADE FROM MOSTLY RECYCLED MATERIALS, THIS ONE MADE FROM A GEORGIA LICENSE PLATE WITH “GEORGIA …… ON MY MIND”. PURSE IS IN VERY GOOD CONDITION WITH SOME MINOR SCUFFS ON THE PLATE. NEAT! ANOTHER LOVELY HANDBAG FROM MY COLLECTION! THIS ONE IS BLACK CROCHET AND HAS CLEAR LUCITE HANDLES. PURSE MEASURES 14” X 8” AND IT IS IN EXCELLENT CONDITION. 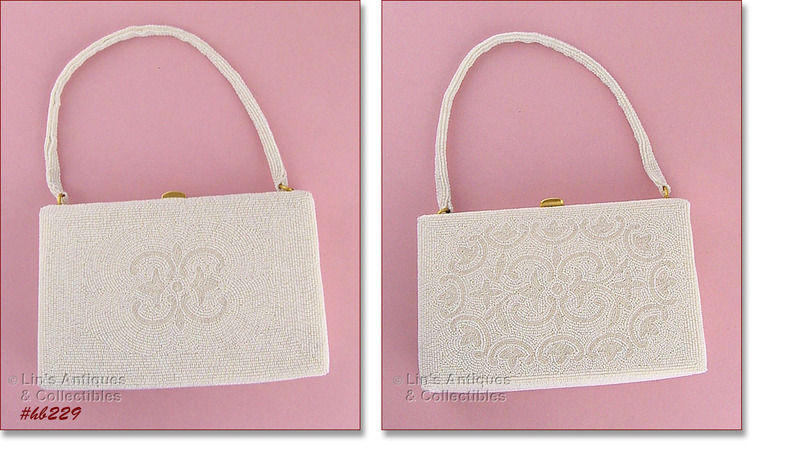 THIS IS A REALLY CUTE VINTAGE HANDBAG THAT HAS BEEN A PART OF MY COLLECTION FOR SEVERAL YEARS. IT IS NANTUCKET STYLE AND THE LABEL INSIDE HAS “CARROLL REED SKI SHOPS, NEW HAMPSHIRE”. SUPER HANDBAG IN SUPER CONDITION! EXCELLENT CONDITION ALLIGATOR HANDBAG! IT IS CLUTCH STYLE (THERE ARE TWO INTERIOR LOOPS FOR A SHOULDER STRAP BUT THE STRAP IS MISSING). HANDBAG MEASURES 10 1/8” LONG, 5 ½” TALL, AND HAS 2 INTERIOR COMPARTMENTS SEPARATED BY A ZIPPERED COMPARTMENT. THE INTERIOR FLAP HAS A GOLD COLOR ALLIGATOR STAMPED INTO THE LEATHER. I PURCHASED THESE SHOES YEARS AGO AND AS YOU CAN SEE IN THE PHOTOS, THEY ARE IN EXCELLENT NEVER WORN CONDITION! THEY ARE IN THE ORIGINAL HALSTON BOX WITH THE PRICE STICKER OF $85 STILL ON THE BOX. SHOES ARE MARKED HALSTON, MADE IN ITALY AND ARE STAMPED AS SIZE 9M. THIS TYPE SHOE RUNS A LITTLE SMALL -- I WEAR SIZE 8 M AND THEY FIT PERFECTLY. THE LEATHER IS NAVY BLUE AND THE STRAP ACROSS THE BOTTOM (TOE AREA) IS COVERED WITH MESH MATERIAL (LIKE USED IN WHITING-DAVIS HANDBAGS). ALTHOUGH THE MESH HAS A MORE GREENISH CAST/COLOR IN PHOTOS THAT IS CAUSED BY OUR CAMERA FLASH, THE MESH IS ACTUALLY A PRETTY IRIDESCENT BLUE/GREEN COLOR. THE ANKLE STRAPS WRAP AROUND AND YOU TIE THEM IN A KNOT OR LOOP -- HOWEVER YOU LIKE TO KEEP THEM TIED. THESE ARE VERY HIGH HEELS -- MEASURE 4 1/2" IN HEIGHT. THIS LITTLE VINTAGE HANDBAG HAS BEEN A PART OF MY COLLECTION FOR MANY YEARS! IT WAS MADE BY KORET, MEASURES 4 ¼” X 7 1/8” X 3 ¾” AND IS CLEAN INSIDE AND OUT. EXCELLENT CONDITION! ANOTHER GORGEOUS VINTAGE HANDBAG! THIS ONE IS BLACK FAUX REPTILE AND HAS GOLD TONE METAL TOP CLOSURE THAT’S ACCENTED WITH MULTI-COLOR RHINESTONES. INSIDE ZIPPERED POCKET HAS “MEYERS, MADE IN USA” AND PURSE MEASURES 6 ¾” X 8 1/8”. SUPER CONDITION – I NOTICED SOME WEAR TO THE GOLD COLOR AT THE LIFT-UP PORTION OF THE CLASP – THAT’S IT! ISN’T THIS PURSE AN EYE-CATCHER? IT HAS SIMPLE STYLING WITH THE FOCAL POINT BEING THE HANDLE AND MATCHING FRONT ADORNMENT. PURSE MEASURES 6 ½” X 8 3/8” AND HAS 2 INTERIOR OPEN COMPARTMENTS SEPARATED BY A ZIPPERED POCKET. EXCELLENT CONDITION! ANOTHER SUPER ENID COLLINS HANDBAG -- THIS ONE IS TITLED “POT O’ GOLD” AND IS A COLLINS OF TEXAS PURSE. I THINK IT'S ESPECIALLY NEAT BECAUSE AT FIRST GLANCE, THE MAIN DESIGN APPEARS TO BE A FACE -- THE COINS AND BEADS ARE STRATEGICALLY AND INTENTIONALLY PLACED FOR EYES, NOSE, AND MOUTH -- BUT WHEN YOU LOOK CLOSER/AGAIN, YOU CAN SEE THAT IT IS INDEED A POT FILLED WITH "GOLD" COINS. THE LINEN IS VERY CLEAN WITH NO STAINS OR SPOTS AND ALL BEADS/DECORATIONS ARE PRESENT. PURSE IS ALSO VERY CLEAN INSIDE. THE EXTERIOR WOODEN BOTTOM HAS SOME SCUFFS, ETC. WHICH IS TO BE EXPECTED. THIS LOVELY HANDBAG IS A SUPER ADDITION TO AN ENID COLLINS COLLECTION AND IS NOT YOUR EVERYDAY FIND!